NASA's Ares I first-stage motor sits on ATK Space System's test stand in Promontory, Utah, awaiting its test firing, set for Aug. 27, 2009. 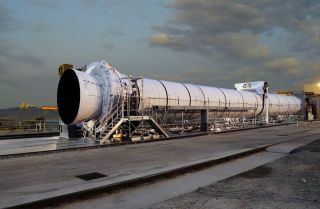 The 154-foot solid rocket motor will produce heat two-thirds the temperature of the sun and its 12-foot-diameter cylinder will deliver 3.6 million pounds of thrust. This story was updated at 7:52 a.m. EDT. Alast-minute glitch forced a NASA contractor on Thursday to call off the firsttest firing of a new rocket intended to replace the agency?s aging spaceshuttle fleet and help return astronauts to the moon. The $75million test by Alliant Techsystems, Inc. (ATK) in Promontory, Utah, wasintended to demonstrate a giant solid rocket booster - the first half of NASA?sAres I rocket designed to launch the astronauts into orbit after the spaceshuttle fleet is retired. But a power unit required to point the booster?sengine nozzle properly failed with just 20 seconds remaining in the testcountdown. ?This is partof what you do when we do tests, this is part of the job,? said Alex Priskos,first stage manager for NASA?s Ares Projects Office at the Marshall SpaceFlight Center in Huntsville, Ala.
Engineersbelieve that a fuel valve in an auxiliary power unit that drives the rocket?sbooster nozzle hydraulics may have failed, but they aren?t sure why. They willwork through the night to hunt its source, experts said. NASA is now targeting no earlier than Tuesday to reattempt the enginetest, which secures the rocket in place on its side for the duration of astatic engine firing. Its cancellation Thursday disappointedthousands of onlookers shown in televised NASA video eagerly awaiting the testfiring. The firststage of theAres I rocket is 154 feet (47 meters) long and is larger than the solidrocket boosters used to launch NASA space shuttles into orbit, though both arebuilt by ATK. It is built to provide up to 3.6 million pounds of thrust, enoughto launch the entire 327-foot (100-meter) tall Ares I rocket about 36 miles (58km) into the sky in just over two minutes. Theshuttles use two solid rocket boosters, each made up of four segments. The AresI first stage is just one booster, but has an extra, fifth segment designed to addthrust in order to launch Orion spacecraft - the shuttle?s successor - and itsliquid-fueled upper stage towards space. NASA plansto use the Ares I rocket to launch astronauts aboard Orion vehicles by noearlier than 2015, with the first flights bound to the International SpaceStation. The rocket is part of the agency?s Constellationprogram to return astronauts to the moon by 2020. However, anindependent committee that reviewed NASA?s moon visions for the Ares I rocketand its larger companion the Ares V booster for the White House found that theagency does not have the funding to support the $108 billion project. The committeehas drawn up severalalternative scenarios for President Barack Obama?s consideration and isexpected to file its report by the end of the month. Only one of those options includesthe Ares I rocket. The others replace it with other rockets or spacecraft. NASA?sfirst test of the full-size Ares I rocket, the Ares I-X mission, is currentlyscheduled for Oct. 31. But that rocket consists of a standard four-segmentsolid rocket booster topped with a dummy fifth stage, as well as mockups of thebooster?s second stage, Orion capsule and escape tower. The test isdesigned to demonstrate ground operations as well as the viability of the AresI concept from liftoff through first stage separation.